Police introduce zero tolerance for illegal window tint. If your car has window tint, better make sure it's within the limits of the law. 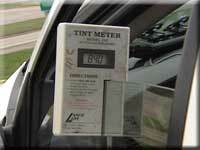 Starting immediately Police will begin ticketing motorists with illegal window tint. Officers are currently enforcing the tint laws, but police say they're starting to crack down even more, because they're seeing a major increase in the number of vehicles with windows too dark to see through clearly. That's why they're setting a zero tolerance policy for the violation. If you get ticketed it could get pricey.